EXPLANATION OF WEST NILE VIRUS PICTURE: West Nile Virus is a small (approx. 50 nm diameter) enveloped + single stranded RNA virus. It belongs to the family Flaviviridae (L. Flavus: yellow) named after Yellow Fever. The red worm-like objects covering the surface are the E (Envelope) Proteins. In the mature virion, these exist as dimers with the two molecules in a "Yin-Yang" or "69" position. 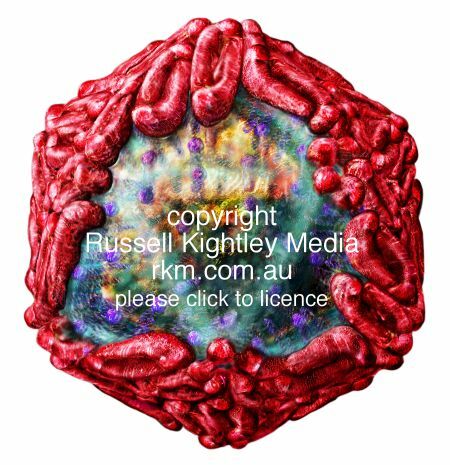 The dimers are arranged in an ordered fashion over the surface of the virus (2, 3). The E proteins vary from type to type, as does the state of their glycosylation (9, 10, 11). The illustration above shows the virus with some of the E-Proteins removed to reveal the underlying membrane (bluish green). The E proteins are anchored into this by membrane spanning regions. Also present are M (Membrane) proteins. In this image, the E anchoring regions and the M-Proteins (and their transmembrane regions) look like little nails hammered into the membrane. 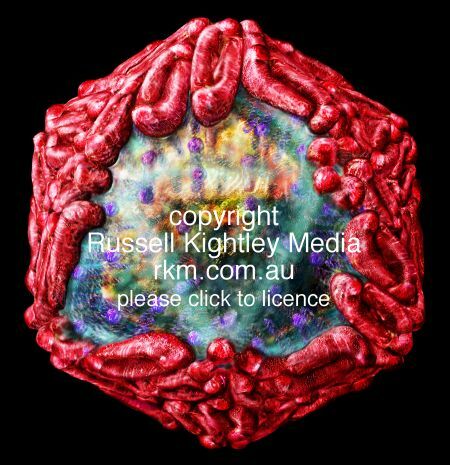 Beneath the membrane lies the icosahedral nucleocapsid (yellowish glow in middle) that contains the genetic material combined with C (Capsid) Protein. Although generally described as spherical, electron micrographs of West Nile Viruses seem to show a clearly faceted virion.